Give romantic candlelight vertical height with one of our hanging candle holders, available in country, primitive, contemporary, and farmhouse styles, by Colonial Tin Works, The Hearthside Collection, Abbott, Market Street, and more! Accent your wall with folk art charm and the warmth of flickering candlelight with this star shaped metal candle wall sconce! 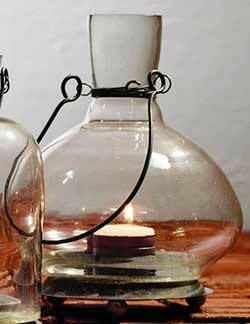 This cloche-style bottle shaped glass tealight candle holder can hang or sit - This is for the Large size. 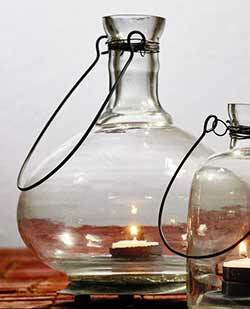 This cloche-style bottle shaped glass tealight candle holder can hang or sit - This is for the Medium size. Large Hanging Star, by Honey & Me. With their old-fashioned, rustic, handmade folk art charm, Honey & Me figures and accents add primitive charm to your country home! This is for the Large Hanging Star. 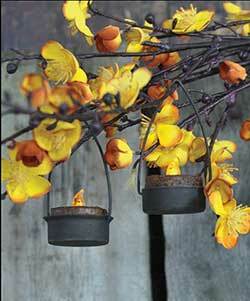 Designed to hang in a window or corner of your room, and hold a taper candle (preferably battery operated). Measures approx 9.5 x 9.5 inches, plus a 20 inch long hanging chain. Does not include candle - taper shown in photo is one of our 4 inch battery operated tapers by The Hearthside Collection. Hanging Star Tealight Holder, by The Hearthside Collection. 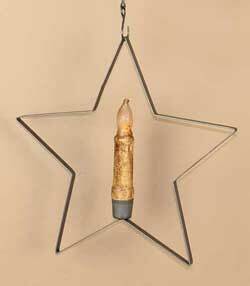 Add primitive charm to your country home with this handing star tealight holder! This is for the BLACK tealight holder. Will fit either our standard tealight candle, as well as the slightly larger timer tealight candle. Measures 6.25 inches long, 4.75 inches wide. Hanging Star Tealight Holder, by The Hearthside Collection. 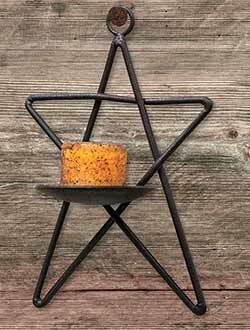 Add primitive charm to your country home with this handing star tealight holder! This is for the Burgundy tealight holder. 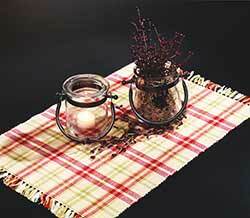 Will fit either our standard tealight candle, as well as the slightly larger timer tealight candle. Hanging Star Tealight Holder, by The Hearthside Collection. 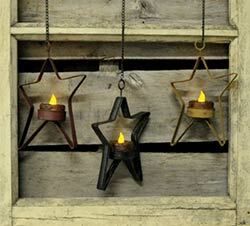 Add primitive charm to your country home with this handing star tealight holder! This is for the Mustard tealight holder. Will fit either our standard tealight candle, as well as the slightly larger timer tealight candle. Simple Hanging Tealight Holder, by The Hearthside Collection. Add a little sparkle of light to a floral arrangement, country tree, cupboard, or windowsill will this rustic metal tealight holder!